The law firm of Woody Law Offices, P. C. has extensive experience and expertise in all areas of personal injury litigation. Woody Law Offices, P. C. can provide you with high-quality, legal representation that provides for timely settlement of your law suit. When a claim proceeds to litigation or arbitration, we work to provide our clients with the best possible position for negotiating a favorable resolution of the claim. What constitutes a Personal Injury claim? If you are injured as the result of someone else's negligence you can pursue a personal injury claim against that individual or against those responsible for your injuries to compensate you for the damages you suffered. A personal injury claim can include all types of auto accidents including being a driver or a passenger in a car or truck or on a motorcycle or bicycle. Premises liability cases includes such things as unsafe buildings or grounds. If you pursue a body injury claim you may include several types of damages available to you such as pain, suffering, humiliation, distress and economic damages such as lost wages, medical bills and other expenses associated with the loss. 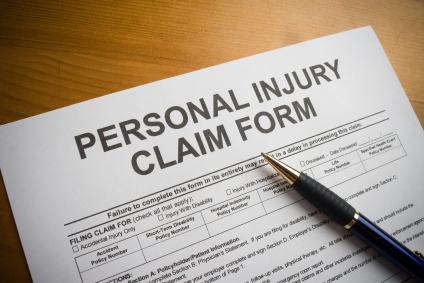 What are the most common personal injury claims? Motor vehicle accidents are the most common personal injury claims. We represent auto accident clients and almost all personal injury claims on a contingent fee basis.